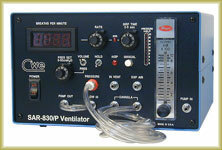 All ventilators operate on the flow-time principle. This method uses a constant flow of gas, which is gated into the animal for a known time, thus producing a known volume (flow x time = volume). This simple but powerful approach gives great flexibility in setting ventilation parameters such as inspiration time, I/E ratio, and more; something that is difficult or impossible to accomplish with the older mechanical piston-pump technology. In addition, this contributes to the legendary reliability and long service life of our ventilators, since the only moving parts are a pair of long-life solenoid valves. All that is required is a Moving Average of the nerve activity, which is connected to the USB box. Adjustable trigger levels and a “backup” standard ventilator are included. 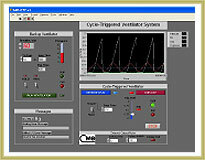 This system allows complete remote-control of the ventilator.